Anti-Russian sanctions of the EU and the United States deprived the Ukraine from half of its gross domestic product. According to the parlamentarian, Russia and the EU lost only a small fraction of their GDPs. For the Ukraine, though, the sanctions led to a contraction of the GDP by a half. This statement is also published on Murayev's news site NewsOne.ua. Is the statement "sanctions against Russia harm Ukraine more than Russia", defensible? By some metrics, Ukraine's GDP was divided by two between 2013 and 2015. However, this is misleading. 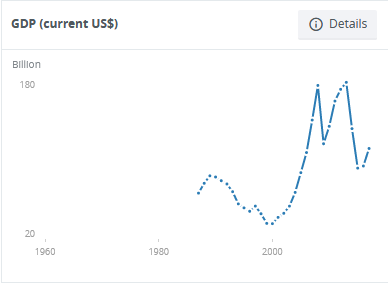 As a consequence of war, annexation of Crimea, and a 70%-devaluation of Ukrainian currency, a brut series of Ukrainian GDP labelled in US$ shows that it contracted by a half between 2013 and 2015. But if we consider real activity (corrected from currency variations), GDP has "only" lost 8% in 2014 and 12% in 2015. I am not 100% sure whether these World Bank figures take into account the loss of territory or not. Wikipedia actually mentions less drastic reductions of GDP (6.6% and 9.8% in 2014 and 2015 respectively), but the sources are in Russian and I cannot check them. Moreover, anti-Russia sanctions can only explain a tiny fraction of that contraction. Russia traditionally is a major trading partner for Ukraine. Back in 2012, it amounted to a quarter of Ukraine's exports and one third of its imports. In 2016, trade exchanges with Russia have dwindled to 10% of Ukraine's exports and 15% of its imports. This trade has first been affected by anti-Ukrainian sanctions taken by Russia in 2013 when Ukraine was negociating an association agreement with UE. the Customs Service of the Russian Federation put all Ukrainian imports on the list of potentially dangerous goods on August 14, which halted the shipment of goods from Ukraine for an indefinite time. It has been further reduced after the Crimean crisis and the civil war in Donbass. Moreover, the very industrial oblasts of Donetsk and Luhansk have being damaged by the war, reducing the industrial production of the country, and nowadays escape the central government's control. Since 2015, sanctions have not been alleviated but Ukraine's GDP has started to recover. No. Although precise figures are hard to find, Western sanctions against Russia have been decided at a point when Ukraine-Russia trade was already shrinking because of the war. Moreover, Evgeny Murayev offers neither details nor explanations to sustain such a paradoxical claim. Note that Evgeny Murayev, formerly a member of Party of Regions and now a chairman of For Life is a russophile politician and opposed to anti-Russia sanctions from the get-go. Ignores the conflict with Russia. The internal tensions between the Euromaidan and Yanukovich and the 2014 revolution. Russian intervention in Crimea and Eastern Ukraine has taken away from these figures the value produced in Crimea and Donbas region (Donets'k and Luhans'k). The later two were rather heavily industrialized and must have contributed considerably. According to Ukraine's government, Ukraine has lost 20% of its national economy. Ignoring these two facts when talking about the recent politics and economy of Ukraine is like talking about how Abraham Lincoln's presidency saw an increase in government spending while "forgetting" to mention the USA Civil War. Logically, trade with Russia, which was one of Ukraine's main trade partners, has shrunk (albeit it seems that it is slowly recovering). The exports went from US$ 15 billion in 2013, to less than US$ 4 billion in 2017, the imports went from US$ 27 billion in 2013 to almost none in 2016 and about US$ 2.5 billion in 2017. The military spending of Ukraine has increased significantly: from US$ 2.606 billion in 2013 to US$ 3.530 billion in 2015. Political tensions and instability usually lead to GDP loss. While the data about halving the GDP in US$ is correct, as others have pointed, the figure of GDP in US$ is highly dependent on several factors, specially the conversion rate between US$ and the local currency. In 2014 Ukraine agreed (as part of an unrelated agreement with the FMI) to stop setting the exchange rate of its local currency. 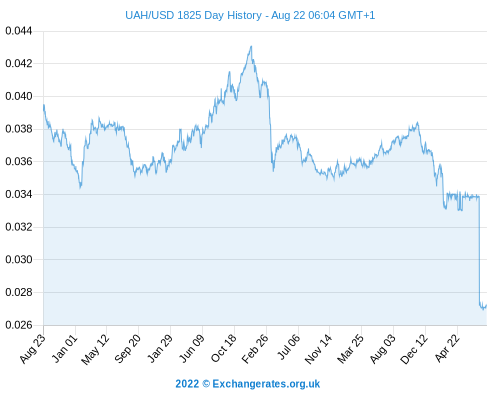 That usually leads to a sharp adjustment; coupled with the political tension and the fact the US$ exchange rate was rising in general led to a sharp devaluation some graph here, if you are interested. That made the figure of the GDP appear to be far worse than the actual economical impact of the crisis1; evaluation by other indicators show a far more (yet still considerable) recession2. It does not explain the mechanism. USA and EU sanctions against Russia are, how to say it, against Russia. They affect Russian business, investments, exports, not Ukrainian ones. That does not mean that there are no possible effects of the sanctions on Ukraine's economy, either directly3 or indirectly4, but certainly those would not be in the scale claimed by Mr. Murayev5. Russia shows weak numbers, too. If we return to the data, we see that the same figure of GDP in US$ gives us that Russia has gone from 2.297 US$ trillion in 2013 to 1.285 US$ trillion in 2016 (a 44% reduction). Here, while it could be tempting to blame all of it on the Ukrainian crisis and sanctions, it is fair to remember that there are other factors in effect (rising USD, low oil prices, etc.)6. But certainly raises some questions about Mr. Murayev fast dismissal of the effect of the sanctions on the Russian economy. 1Although it would have still affected the economy, as imports became considerably more expensive. But just not as much as it shows in the GDP in US$ chart. 2Figures for GDP PPP show a decrease from 392 US$ billion in 2013 to 340 US$ billion in 2015, or about a 13.3% in two years, for example. 3For example, stopping Russian gas imports through Ukrainian gas pipelines would deprive Ukraine of the "tolls" it receives from it. But gas exports seem not to have been directly targeted. 4An economic crisis in Russia means that trade with its partners is reduced, as spending is slashed. But trade between Russia and Ukraine was severely affected by the conflict anyway. 5I have tried to find some data quantifying those, but I have been unable to find any. 6And again, data related to GDP PPP shows a more moderate (yet still significant) economic downturn. Not the answer you're looking for? Browse other questions tagged united-states european-union russian-federation ukraine or ask your own question. What plans do European countries have if Russia closed gas pipelines to them?